In those days Jesus came from Nazareth of Galilee and was baptized by John in the Jordan. And just as he was coming up out of the water, he saw the heavens torn apart and the Spirit descending like a dove on him. And a voice came from heaven, “You are my Son, the Beloved; with you I am well pleased.” And the Spirit immediately drove him out into the wilderness. He was in the wilderness forty days, tempted by Satan; and he was with the wild beasts; and the angels waited on him. Mark 1:9-13. This portion of the reading from this week’s Lectionary illustrates two important ideas relevant to our Lenten discussions. The first is the principle of resistance. In Mark’s Gospel, Jesus emerges from the water, a voice from heaven announces that he is the beloved son of God. There’s a Greek phrase that Mark uses throughout his Gospel, kai euthos. It’s most often translated as “immediately” or “just then.” Mark reports that immediately after this wonderful moment, right after this transcendent announcement, the Spirit drove Jesus into the wilderness. It seems an odd thing: Jesus has just been consecrated to his vocation as the Messiah, the savior, and immediately He’s sent to the desert to face temptation. We get a sense of the loneliness of Jesus’ situation, an isolation illustrated by the notion of “the wilderness.” (In this sense, Jesus will share the Genesis experience of being “cast out” with us, will share in the Exodus experience of wandering in the wilderness.) The phrase “the wilderness” connotes chaos, fear and a landscape where death and sin become a real possibility. Even while he was in the wilderness with the “wild beasts”, Mark reports that the angels waited on Jesus. Now, the angels acted as the messengers of God. I think Mark is trying to tell us that even in that wilderness of spiritual desolation, God will not leave us alone. Somehow, someway, God will speak words of comfort, courage and peace. Learning to listen for them when we are ravaged by our terrors, that’s the tricky part. 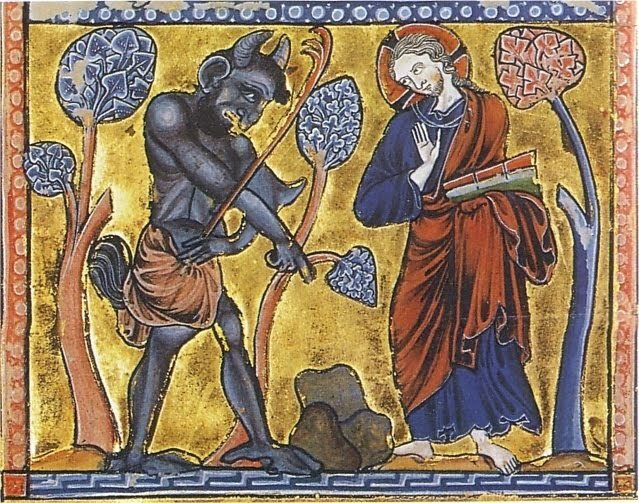 Mark’s Gospel describes Jesus as having been “tempted by Satan”. As usual, Mark doesn’t provide many of the particulars here. Both Matthew and Luke offer more detail about the specific temptations Christ suffered. We do know one thing about Satan, however. Jesus said that Satan “does not stand in the truth, because there is no truth in him. When he lies, he speaks according to his own nature, for he is a liar and the father of lies.” John 8:44. In this teaching, Jesus illustrates for us something important about the very nature of sin. I believe that most sin, if not all sin, originates with a lie. The German people could not have burned 6 million Jews without first deceiving themselves into the belief that the Jews were less than human. We Americans could not have participated in the brutality of slave labor and the slave trade without first believing that the Africans were “chattel”, that they were animals. Or maybe we persuade ourselves that we haven’t had that much to drink, and we’ll have just one more glass of wine before driving home. Sin generally originates in a lie, because deception is the currency of sin. In my law practice, I’ve handled a number of cases of embezzlement. In almost every case, the employee has convinced themselves that their employer has taken advantage of them somehow, and they’re merely recovering what the employer should have given them. I think I understand these folks because if I have a superpower, it’s my ability to deceive myself and rationalize. And when I stray “out into the wilderness”, I find that deception is the native language of sin. If we begin to view sin as separation from God, rather than simply doing something naughty, we start to see the subtle danger here. Jesus described himself as the way, the truth and the life. Of course, the Father of Lies must separate us from the Truth. Using this Lent as an opportunity for genuine reconciliation, therefore, requires that our self-examination must be firmly rooted in the unyielding truth. As we approach Jesus, the closer we come, the further we move away from Our Ancient Enemy. C.S. Lewis once observed “There is no neutral ground in the universe; every square inch, every split second, is claimed by God and counter-claimed by Satan.” God always seeks our union with Him; Satan always seeks to divide us from God and his children. I pray we use this season of Lent to reflect on those things which operate to come between us from the Almighty, and to take a few steps back towards our real home.